June 6, 2017 in Münster, Germany. Such a card holds the potential of seamless international student mobility by providing access to services such as library use, student restaurants, copy machines, or local transportation – all on one card and with cross-border functionality! 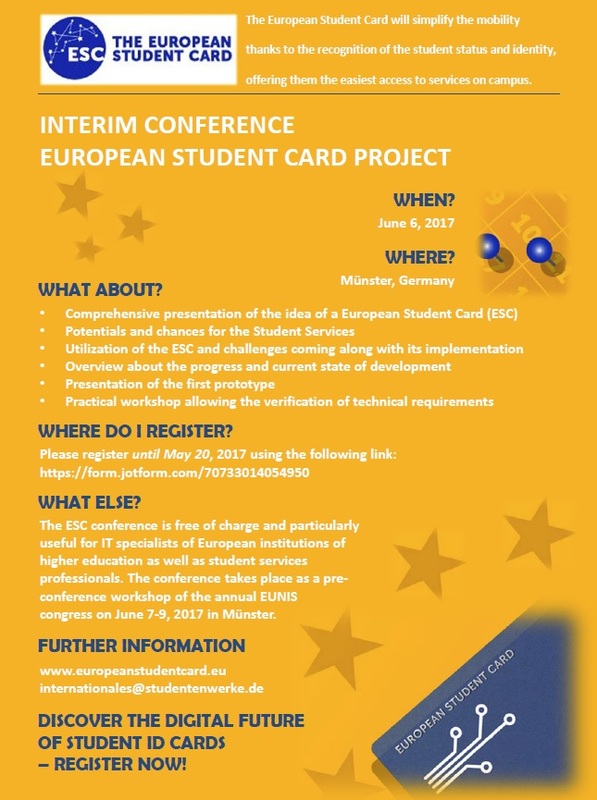 The conference presents the current state of development of such a card, the necessary online platform, and the options for practical implementation that are being developed in the framework of the EU project “European Student Card” (ESC). The meeting is aimed at leaders in higher education who are interested in the digital future of student ID cards, and is particularly useful for Heads of Student and/or IT services. The conference provides an excellent opportunity to evaluate the potential of your own institution to issue a student card with European functionality. The conference is arranged as an the 1st conference of the EU project, and intentionally takes place in the context of the EUNIS 2017 annual congress, as a pre-conference workshop on June 6, 2017. If you are working in a leading IT position in a university or institution of higher education, might want to consider extending your stay to attend the EUNIS congress in Munster for the two following days as well. Participation in the ESC conference on June 6, 2017 is free of charge and open to all. The conference language is English.